Washington DC (SPX) Oct 14, 2010 ! 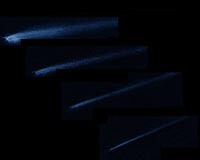 NASA’s Hubble Space Telescope has captured the first snapshots of a suspected asteroid collision. The images show a bizarre X-shaped object at the head of a comet-like trail of material. In January, astronomers began using Hubble to track the object for five months. They thought they had witnessed a fresh asteroid collision, but were surprised to learn the collision occurred in early 2009.